Creating and examining art is a serious business and therefore by definition, cannot involve playing. This is the misconception of those who think that art is constant: the character of art and the role of the artist are as changeable as the weather. Using play as the starting point for a new art genre, the toyists recorded their artistic credo regarding the use of shape and vivid colour in a manifesto. The themes are amongst others, derived from toys which can be brought to life in order to play an active role themselves. New art forms are continually emerging; forms that repeatedly seek to convey new feelings about life. Frequently, these new genres are met with ridicule, disapproval and indifference. In hindsight, new works such as these often prove to be the embodiment of an aspect of the changing nature of life. Whatever attitude man adopts towards the discoveries of youthful artists, it still remains essential that he acknowledge and explore their work; thus enabling the observer to gain a correct view of what is taking place in his environment as a whole, and not simply the art world. Silkscreen printing comes from Japan and became known in Europe around 1930. Another name for an artistic printing is silkscreen printing. The principle behind the technique is quite simple. A piece of fine mesh made out of silk, polyester or steel is strained on a window frame. The name of the technique is also named after this mesh (literally silkscreen printing). It is a stencil method of print making in which a design is imposed on the fine mesh, with blank areas coated with an impermeable substance. Ink is forced into the mesh openings by the fill blade and by wetting the substrate, transferred onto the printing surface during the fill blade stroke. As the screen rebounds away from the substrate the ink remains on the substrate. One color is printed at a time, so several screens can be used to produce a multicoloured image or design. Different ink is needed for different materials. The principle behind the technique is simple, making a silkscreen is not. Craftmanship is needed to make sure every new layer of ink is printed correctly. Screen printing ink is bright in colour and opaque. This makes it very suitable for toyistic art, that always has separated fields of colour. ‘Let the Games Begin’ is an unusual title for an exhibition or a catalogue. Creating and examining art is a serious business and therefore by definition, cannot involve playing. This is the misconception of those who think that art is constant: the character of art and the role of the artist are as changeable as the weather. In the period when the majority of the population were illiterate, the artist did as he was commissioned. He depicted the heroic deeds of the authorities in public buildings and on the walls of the church, the bible story. In this way, the artist clarified the ideals of various types of authority in a kind of ‘comic strip’ format. ‘I am a God in the deepest part of my mind.’ The meaning intended here was that artists adopt an attitude which is independent of any person or situation and only allow themselves to be lead by their ‘divine’ inspiration. Result of this was the creation of priceless but incomprehensible art which required a host of interpreters to guide the ignorant from the cradle to the grave and in doing so bridge the gap between art, artist and public. Currently, we are still experiencing this, although new generations of artists have given rise to varying aims and concepts. Examples of this are one group who took the landscape as its material to create Land Art while another group used the physical body as sculptors’ material; becoming known as Body Art. If artists particularly accentuated their presence, these were called Performances. It was out of this situation that three artists united as a group who, lead by Dejo, wanted to react against the established laws of art under the name of the Toyists. Using play as the starting point for a new art genre, they recorded their artistic credo regarding the use of shape and vivid colour in a manifesto. The themes are amongst others, derived from toys which can be brought to life in order to play an active role themselves. I think that one beautiful example of this is: cows who want to look like sheep. The fantasy of play seems to have gone so far that the seasons can even be linked to music genres such as springtime with Jazz, summer with Classical, autumn with Rock and winter with House music. 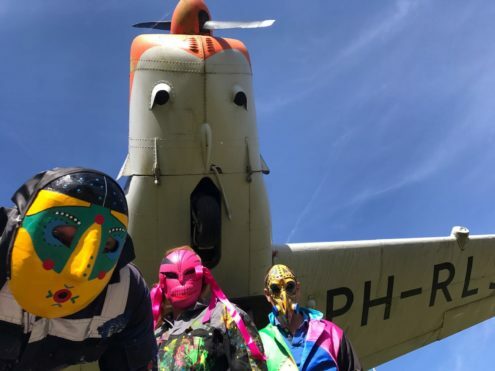 As everything in art as well as politics and sport revolves around the individual, the Toyists elect to appear in a group and herein for anonymity. Each one has taken on a pseudonym and portrays himself as a cartoon-type figure. Announcements are made public in the form of printed texts and manifestos without appearing in the media. A new step was taken in 2005 with the ‘Let the Games Begin’ publication and similarly entitled exhibition. Until then, every artist had played an individual game within his own composition. The compositions became the starting point for everyone, so that the work of two artists could be combined into one work of art via certain rules of play. Although a number of those results are illustrated here, during the exhibition every visitor could create his/her own arrangement and for a price, also take it home. Tic Tac Toe (US) or Noughts and Crosses (UK), is probably one of the first strategic games that some of us ever played. Anyone able to draw a grid, an X and an O, is able to play the game. Although many of us consider this a strategically simple game, we have all lost at one time or another. If you know what you are doing: you cannot lose. If your opponent knows what you are doing: you cannot win. When the optimum strategy is employed: every game results in a draw. Fortunately, the Tic Tac Toe of toyism is not just about winning – it also involves the creation of a new composition. This composition comprises 9 paintings: the 10th painting is variable. Both players or observers arrange the pictures and in doing so, continually create different compositions. This actively involves the observer in the composition and final result. Each work of art consists of a main theme which also serves as the title of the work. The main theme is expressed by 10 paintings; so-called subtitles. Both artists playing against one another have chosen a main theme consisting of two elements (opposites). Each artist has created 5 paintings for every game. Only one element of the theme appears in 4 out of the 5 paintings, while both elements of this theme are contained in the 5th painting. Each artist applies his own interpretation to theme and style. This old Dutch game presents a series of contemplative effigies. The essence of this match encompasses the typically human pre-occupation of playing with image and how we deal with individual identity. When we hold a mirror to ourselves, do we really see our true face or something completely different? As a human being we can be in harmony, or on the contrary, in conflict with this. Where do these issues overlap or conflict with one another? Ultimately, these are all conscious images which are necessary for us to be able to identify with our inner selves and those of others.